The Tumbleweed Cypress Tiny House on wheels is one of my favorite designs on trailers so I’m showing it to you here because it might be a great option for you or someone you know. The Cypress is part of the Tumbleweed tiny house design family and is available in 18′ (130 sq. ft.), 20′ (144 sq. ft.), and 24′ (172 sq. ft.) sizes. When you walk inside there’s some open living space and a sitting nook. There’s also a very nice kitchen with a built-in washer/dryer unit too. When you walk to the back of the house you can get to the bedroom and bathroom. Then there’s also a built in staircase with storage that leads you to the upstairs sleeping loft. You can also get it with dormers in the sleeping loft for more spaciousness. Please enjoy the photo and video tour then re-share if you want to below. Thank you. If you enjoyed this Tumbleweed Cypress Tiny House on Wheels you’ll absolutely LOVE our Free Daily Tiny House Newsletter with even more! Thank you! I love this one so much. While I watched the video I was already visualizing how I would decorate lol. This would be fantastic to live in! Bravo!! me too! i was mentally decorating and making some slight alterations! I went inside a Tumbleweed Cypress at an RV show locally just a few weeks ago. It was charming to look at, both inside and out. I just really could not get the strange long skinny space (where they show a twin bed). It’s narrow and long and it seems practically unusable to me. In such a tiny space, a three foot wide 6 feet long rectangle that has no clear purpose is major waste of space. I was thinking it’s the perfect place to store a bicycle. You could have it as a office with a built in bench that converts to a bed if you have someone sleeping over. I like the fact that the space is left to be whatever suits the occupant like the person said above they saw it as bike storage. To a young person it could be a walk in wardrobe/dressing room or a chillout area with beanbags. It has a lot of potential. What Im not so keen on is the inclusion of the fixed cooktop I think this is better dealt with a portal induction hotplate so you can multipurpose the bench space for other activities such as food preparation or buffet. Another thing I would do is consider a slide out table top into the living space for dining purposes. Im not keen on the bench sitting area by the door it just looks really uncomfortable not relaxing at all that would need some modification in my eyes. Im thinking interlocking modules that could become seating at the slide out dining table or a comfy daybed when locked into the main bench or as ottomans to put your feet on. Hard wearing comfy fabric such as thick corduroy or heavy linen. Storage underneath of course. The bathroom however is perfect that is the best tiny house bathroom I have seen so far. Best use of functional space and with a proper door. The stairs are good and Im not good with loft bedrooms but actually feel I could sleep in this one even with a thicker mattress. Your designs are getting really good the improvements you make over time are nearing perfection. I could definitely see myself living long term in this space with a little modification. The space is very narrow and long, which makes it difficult to do much with. You might put a desk at the end of the space, but then what the rest of the space is is a hallway to the desk. Doesn’t work for storage really, either, as the space is so narrow. I was thinking that the little bedroom would be a perfect place for my sewing room. I am sooo excited about this TH plan. Marcy, I agree with you. I’d rather see a slightly larger bathroom all across the back of the trailer with the only bed in the loft or a couch/bed or murphy bed in the living area. If that long narrow space was removed and the bathroom rotated 90 degrees, just think of how much larger the living area would become! I do love the washer/dryer location though. That is brilliant! Exactly! The living space is so small already that those few extra feet gained by rotating the bathroom and removing that area would really make the living space an actual space you could live in. I know people have commented that you could use that space for an office or sewing room, but at 3 feet wide, it really isn’t very adaptable. Myself, I’m not wild about how obvious the washer/dryer is, but if you put a chair or small table in front of it, it would still be easy to get to when you needed it. Or maybe a sliding panel (think barn door, only small) that covers it and just slides to the side when you want to use it. Or even more useful might be a pop-up table – covers the washer/dryer when down, swings up to be you small table. Marcy, I totally aree, a fold down table to HIDE the washer/dryer from the great room would be great while folded down and while folded up, certainly useful, though you’d have do laundry UNDER the table, not so convenient unless it folded from the Down position to a total UP position, not horizontal to the floor, but vertically up so that you could easily do laundry. My problem with that idea is that I (maybe not the rest of the world) wouldn’t want to take all my stuff off the table to fold it either up or down AND I’m not fond of sitting at tall chairs as that counter top is probably 36″ high (tables are 30″-32″ high with normal dining chairs), but it is certainly a great idea in the right direction. I LOVE your “small” Barn Door idea. I see one problem with it in that the washer/dryer is generally wider than kitchen cabinets, it sticks out, but if you were making your own kitchen cabinets rather than purchasing them, you could literally make them just a little deeper to accommodate for the wider appliance and, yes, use a small barn door to hide it. The door could hang from the under side of the counter-top overhang. MAYBE if that barn door were easily removed, it could double as a talbe with some type of hooks/legs that would attach to the wall with one or two legs. I think we have a winner. Who wants to try this??? The Cypress is available in three or four layouts besides what is shown in this article. In one of them, the kitchen fills the nook, and you look out the front window while standing at the sink. And the bedroom is optional–see the Cypress Overlook plans. I agree with the comment that the bench in the nook doesn’t look too comfortable, but it’s a piece of furniture that was placed there; it’s not part of the house. I saw (can’t remember which site) a similarly-designed house in which the owner placed a huge recliner in that nook–that’s for me, since I already have the recliner! This is one of my favorite TH designs, and it’s now available as a 28′ long house, which may solve some of the other issues mentioned above. Even though I sound like a salesman, I’m not affiliated with Tumbleweed in any way. I just like this design, even though a THOW would not work for the three of us. Our son is disabled and we need more space than a THOW would offer us. I lived for 6 years in a Tumbleweed Lusby (the Elm is based on this older design) and it has just such a space. I had a fold down table and this was my office space. I also installed rails and slats so that it could be transformed into a twin bedroom which I did use while recovering from hip surgery. I now live in an Elm with a Murphy bed in the main room and I do miss my little office a bit! There are some pics of the Lusby on my blog, if you care to see it. I have always had trouble with that space, too. I’ve never been able to go inside a Cypress to experience the size of that space, but if at all possible, I would take the big windows out and replace them with “eyebrow” windows along the top for light, and then use the rest of the space for built in cupboards to have a pantry. I always am looking for pantry space to get clutter out of the way and be able to shut the door on it. Very nice! Lots of nice features. Alex, for the last few days I get no sound when I play the videos. If I go to YouTube and play them the sound is fine. I really like the layout of the Cypress, but the front roof does kind of confuse me. Why not make it like the Elm and use the gained space for storage? Likewise, I like how this design incorporates the dormers for additional loft space. Otherwise, the Overlook is an awesome design, and if I were to build that large (I’m currently looking at a 12′ trailer), I’d go with this design and the Elm front roof. Nevermind, the first picture shows it without dormers. I see that they updated the blueprint (at least with the equator model) with dormers. Good change, and I like the washer/dryer unit in the hard-to-use space of the kitchen’s L.
That may be the best layout configuration I’ve ever seen in a tiny house. Essentially, a two-bedroom home. The kitchen “L” with the clothes processor is ingenious!!! Hi Hunter … in the US they’re call combi or combination units. It’s a washer and dryer in one appliance. You put your clothes in, add detergent and whatever, set it like you want and it washes the clothes and when it’s done, it automatically goes into a dry cycle. Many use 110 vAC and are exceptionally efficient. It takes about 3.5 hrs to process a load and some complain about that, but I had one at a weekend property and they are very nice and I enjoyed having it. In the EU they’re called clothes processors or just washers. On their website you can calculate how much it will cost to have them build this house for you. I omitted a lot of things and it still came out to 74,000.00 . The base price is 66,ooo.oo for the one they show here. Which you get just alittle more than just the shell. Way too much money. also everything you see in this video is extra. this house that you see in this video will cost you 80,000.00. The whole point of going tiny is not to have a mortgage. Yup, I agree with Maria. For $80K you can buy a small regular house on some kind of foundation…..have a one or maybe two stall garage for your car and tools …..and own the land. Of course, it may not be located in your dream area, and you won’t be able to move it anywhere and you will have to pay taxes. But you WILL be able to walk on both sides of a large bed to change the sheets, have a shower in which you don’t constantly bump your funny bones, have more personal space, etc. Pretty soon, the cost of a tiny house will be so high that it will turn everybody off. That’s not where I want this trend to end up. After seeing the tiny homes that have been featured I am so disappointed. I really thought that I would be able to afford a tiny home-I was thinking under $30,000. I have been looking into alternative living spaces for about 20 years studying monolythic dome houses RV and containers. If we can keep the price under 30k I believe this is the way of the future. Dont like your neighbor pick up and leave. Dont like the weather hit the road. Not sure that downsizing has anything to do with building a cheap house for you … What I mean is: It takes craftsmen with skills to build a house this beautifully. If you want a cheap house build it yourself. Don’t have the skill? Learn … or pay someone with the skills to build it for you. We cannot complain about the price of something if we have no idea what it takes to create it. I hear the same complaint at the farmers market: That is really expensive for that fruit or those vegetables. But, do you have any idea what it takes to grow those fruits and vegetables? I’m going to guess not. My point is, there are a few skills that we can learn, to keep costs down and become more sustainable. Those would be: Build your own house, grow your own food and learn to sew. Don’t complain about the price of something, learn to do it yourself. Or just quietly sit there in amazement, lusting after what the craftsmen produce. Well Michael when Jay Schaffer owned the company you could buy this house complete for 32,000 to 36,000. The only thing that this company has done to this house plan is add a dormer,stairs and washer/dryer . I don’t feel that doubling the price and then some for the added thing are worth that much more. Example the stair will cost 1,000.00. You can build these stairs or have someone build them for around 200.00. Get my point? The new owners are charging way too much. Nup, the point of going tiny is going tiny. For some not having a mortgage “may” be a reason to go tiny, but not necessarily. Some people want to go tiny so they don’t have so much cleaning to do. Or space to heat/cool. Some go tiny so that truly, wherever they go they are always at home. I like the look of these and a lot of the components and I’m sure they work for a lot of people. They tug on the heartstrings with a certain quintessential “houseness”, but the door on the end instead of the side is just too limiting on the layout. The inevitable traffic flow is too much like a hallway all the way through. The little nook is cute and may be functional for many but I prefer the use of the full width for a lounging area that you can stretch out on or use as a sleeping area without any conversion. There is still a lot of emphasis on fully separate areas that feels chopped up to me. Having the washer face into the sitting area completely kills that whole corner except for something that you have to drag out of the way every time you use the washer. My ideal design would leave a large open space in the middle that can be considered part of whatever area you’re in, has a lounging area that incorporates some kind of larger view of the outdoors and uses all the valuable trailer space for interior volume. I can understand why someone would want a little private room but I think in the long run it’s a waste of space or ends up being a junk storage area. Living tiny doesn’t mean you take a larger house and just shrink it to get a tiny living room, a tiny kitchen, etc. You have a living space with functional areas, not necessarily separate rooms. Certain functions require privacy and/or permanent installations, the rest should be flexible space. I think the door on the end of the house is more habit than anything. I’ve looked at some floor plans with the door on the side, and I think it makes the space much more adaptable. However, often when I see the door on the side, they put in double French doors, which for light is nice, but again lessens how that inside space can be used. Additionally, the glass double doors certainly invite break-ins. Easy enough for someone to break into a Tiny Home double glass doors or not. No easier or harder than a standard home. Sometimes ambiance over rides practicality. Let’s face it, if every tiny home was totally practical there would be very few windows at all to provide for the over abundance of cupboard space for all the cr*p that most tiny house people are trying to get away from, non? I love this Tuhmbuhlweed ‘ouse ova ere!!! I really like the kitchen and bath area in this one also the unit on the hitch for heat & air but if the price is $57,000. then it’s out of my pocketbook. As time goes on the TH are looking better & better. What a great use of space. Love how the washer/dryer is tucked in and hid. Very nice home. This tiny house lacks a lot to live in it full time. I couldn’t sleep in the bedroom (closet). I would feel I was in a coffin. I do like the washer/dryer though and the storage steps to the loft. Good practice for the future no? Come on, have you actually ever laid yourself down in a coffin? My money is on no. Could be a nice comfortable place for all you know. Just remember, what works for one, doesn’t necessarily work for another. Love this plan! Love that it has two seperate sleeping areas and full kitchen bath and washer dryer! Favorite I’ve seen on wheels yet! the washer/dryer isn’t “hid” its in plain view facing the ‘living room’ at the first thing you see when you enter the door. Debbie, this is part of my thought process, too. I kept wondering why you would spend 3 – 5 times more for a tiny house then a travel trailer the same size. I had the chance to go in a tiny house at an RV show, and it became quite clear to me why. A tiny house does feel like a house. But some of the prices these houses are going for is hard to imagine. 1. Round off square corners on counters to prevent pokes, scrapes, and bruises in a small space. 2. Consider adding accessible drawers on the LR side of the L shaped kitchen. That provides more drawers with a smaller drawer storage capacity but easier access. They would be great for storing items that come out of the w/d adjacent (T towels, linens, bath towels, etc. 3. Add a double layer over counter on the cooktop surface that can be folded out in front of the w/d for dining. 4. Add doors to the kitchen cupboard area and maybe a built in plate drying storage area. I saw a really cool one on another TH site. 5. Make the stairs up deeper. I think they are too narrow and pose a safety hazard. Deeper drawers also mean more storage space. Yeah! 🙂 6. Do they make apartment size fridges with the freezer on the bottom? If so I think those would be better than a conventional freezer on the top. Remember hot air rises AND you need to be able to access the fridge more than the freezer. I saw one TH video where the fridge was actually put on a platform to raise it up for easier access. Inside the platform was storage for pots and pans. Neato. Have you considered using gambrel roofs for better head space in your designs? Personally I like the style. I don’t find this psychologically comfortable. It is too cut up into smaller rooms for my taste but is probably good for others. I’m a bit claustrophobic and it set that off just looking at pictures! I do like the washer in the L corner cabinet… good use of space. A fold down table would hide it when not in use and it looks a good spot to dine. Agree completely. Although cute as a button, it is extremely claustrophobic. For the money, I’d just as soon buy a tacky manufactured home that would at least, provide space. Tiny homes were looking good to me for a while but they really are way too small for my own well-being. I think the odd shape room would be perfect for my cats litter box, climbing tree by the window and food bowls. Also a good place for a dog’s bed, food water and can be easily gated off if you need to contain your dog when not at home! Has anyone figured out an easy way to make a bed that has little or no space around it? It seems like it would be really difficult to do. The downstairs bedroom is wasted space. I’d push the kitchen back, taking up that space and leaving more room in the great room. Agree on the downstairs “bedroom”. How could that be called a bedroom? I’d use it for storage or an office. See the plan for the Cypress Overlook. No bedroom, kitchen in the back. I believe the Overlook is the original layout of the home, back when it was called the Fencl. the only reason i would live in a small house is to save money and be debt free. This house is somewhat cute and the washer/dryer combo is wonderful however, it saddens me to see the dream of the personally built, affordable tiny houses fall into the mode of mass production. At the price of this home you would do better buying a fifth wheel or RV if you want your home to move from place to place. Also, as this house is built it is clear that older or larger individuals could not maneuver or fit comfortably. I mean the living room area alone is a joke for both comfort and size. This would be great for thinner, younger adults with plenty of money to burn. Does anyone have information about wheelchair accessible tiny house living? I have been following these discussions for awhile now as I have plans to build my own TH within the next 2 years. I’ve gathered that Tumbleweed has tried to position itself as the premier builder but I saw something in their own video that gives me concerns. 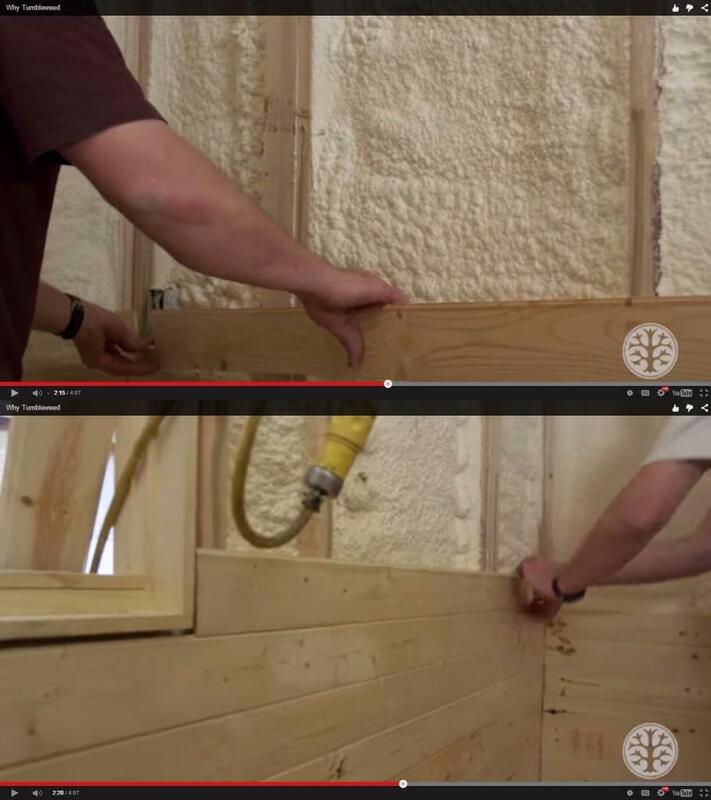 They were showing the installation of the interior paneling on a home which showed the insulated wall cavity as they worked. I was shocked to see where they did not totally fill the void with the expanding foam and in some bays left quite a bit of empty void. Industry standard is to fill and then shave down to the studs. Seems their method is nothing more than a cost cutting measure even though the try to put themselves out there as the premier builder. I have the screen grab if anyone wants to see what I am talking about. INTERESTED TO SEE YOUR OBSERVATION. I would like to the thought that …Tiny Houses are only for those who would LIKE them and have need or desire to scale down their lifestyle. If they don’t fit yours , don’t buy or build one. I’ve slept in cuddy cabins on my boat, (29 ‘) and these TH sleep areas are a major upgrade. I just hate to see derogatory comments that might discourage those who see the merit in this scaled back lifestyle. You can do a lot of design things for sure to make it the way you like it. I wouldnt like to see my laundry from the couch either but this is a tiny living sacrifice one makes to scale back. I was glad and surprised to even see the possibility of a combo unit in the house. (a fantastic innovation) beats going to the laundromat ! I am a retired builder and looking to start doing some TH custom building soon. Love the blog and all the insights..Keep it positive ! I was just thinking the same thing. Those rooms are large and open compared to some quarter-berths I’ve slept in. I would so love to have one of these! People tell me, oh, you would get tired of that quick. Tired? Of having less stuff to gather dust? Of less space to keep clean? Of having the freedom to move wherever and whenever I wanted? Psh. If you ever have a giveaway contest, I am in. So much fun to look at! I didn’t read all the comments so maybe someone has suggested this already. To hide the washer/dryer use the barn door idea, but have it so it could also pivot up into a table. With it in front of the w/d you could sit two people, with it to the left of the w/d it could seat three. OR… just build that cabinet with a sliding door. The pivoting barn door does make sense, since you could use it as a dining table. I like that idea. The interior of this tiny home is absolutely beautiful. However, one area of concern is the width of the entrance in relation to the washer/dryer and shower units. Were these features put in place before the walls were finished? Someday the washer/dryer and shower unit will wear out beyond repair. Major demolition and reconstruction work may be necessary if the doorway is too narrow to allow for their removal, and for the installation of their replacements. This is great, but I have 2 things I would do differently. The front door (in photo 2) should be placed on the right hand wall so that the couch can be run the whole width of the tiny home. Also, for my own preference, I’d enclose the downstairs bedroom into the bathroom to make the bathroom larger… OR make that bedroom into storage/closet/pantry. For those of you who don’t like the little bedroom/office space, you may want to look at the Seattle Pocket Mansion. She has eliminated the tiny room, and put the bathroom the width of the trailer on the back wall. She also has an L-shaped couch with the window seat as the short leg of the L, with a table in front of the window seat that folds down from the wall, and you can bring the other leg of the L around to move in front of the table to make a dinette. Lower the table and it becomes a double-sized bed. I love the versatility of it all! It is available for rent on Airbnb, if you want to try it out for yourself. And no, I am not affiliated with her at all, I just love her creative ideas.